Tawny crazy ants are taking hold in the United States, swarming in explosive numbers and displacing other wildlife. But scientists from the University of Texas at Austin recently discovered a chink in the insect's armor that could help control the spread of this invasive species. A parasite, from the fungal microsporidian group, is the first disease found to infect the crazy ant. Discovered by researchers from the Texas Invasive Species Research Program at the Brackenridge Field Laboratory in the College of Natural Sciences, the pathogen is a naturally occurring fungus that can infect and kill large numbers of ants. The finding provides a glimmer of hope in the control of an alien insect that to date has been nearly impossible to eradicate. "We have yet to find an effective control for crazy ants," says Robert Plowes, the lead author on the new study published in the current edition of the Journal of Invertebrate Pathology. "This is the first step towards developing a suite of biological control agents that will give us any chance of keeping ant numbers low in the long run." Discovered in Houston in 2002, the tawny crazy ant, Nylanderia fulva, is the latest in a history of ant invasions from the southern hemisphere. The pest, which is now found in over 20 counties in Texas, is proving to be the worst of the invasive ants, with staggeringly high densities both outside and inside homes. "Areas can be so overrun that dogs don't even want to go outside because they risk getting completely covered," says Plowes. "And you hear stories of people killing them in huge numbers only to have them come back at the same level the very next day." The ants even have the upper hand over other noxious pests. 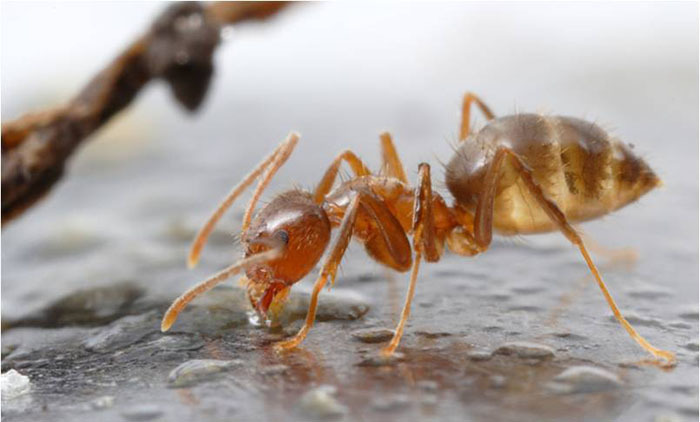 The Brackenridge Field Lab Invasive Species group's pioneering work on invasive fire ants, led by co-author Ed LeBrun, revealed last year that tawny crazy ants outcompete even their stinging counterparts, having the ability to detoxify fire ant venom. Plowes says that the difficulty in controlling the ants comes down to their ability to create supercolonies. "They don't have territory boundaries between colonies, which means that even if you kill them in one area, the supercolony survives and will just swarm straight back in." But while the supercolony effect makes the ants nearly invincible to chemical pest control, it does give them a weakness that makes them ideal candidates for biological control. "Supercolonies may be very susceptible to disease because their nests are often in contact, and they are expected to have low genetic diversity," says Plowes. "We expect that a pathogen would be a good solution for crazy ants because the supercolony effect would allow a disease to spread through it like wildfire." Biological control has over the last three decades become the recognized method for mitigating the scourge of pest species at the landscape level. Work on fire ants has revealed a suite of natural enemies that degrade existing colonies, potentially reducing their longevity and growth rates, while also preventing new colonies from establishing. So when the researchers started noticing bloated abdomens in some specimens of crazy ants collected in invaded counties, they knew they were on to something. "We had seen the same symptom in fire ants that were infected with other microsporidia, so we knew to investigate it further," says Plowes. The scientists examined the infected ants internally and found fungal spores, which they confirmed belonged to the microsporidian group of fungal parasites. Microsporidia are widespread among animals, but the team's discovery is only the fifth species known to infect ants. The researchers then followed up with a molecular study that revealed an extraordinary finding: the microsporidium parasitizing the crazy ants was a new genus completely unrelated to those infecting other ants. Plowes says this has important implications for the use of this species as a biological control agent. "It suggests that this parasite will only affect crazy ants, and won't have knock-on effects to other ants," says Plowes. "When you are looking for a candidate biological control agent, you want something that will be specific to its host." Now that researchers have identified the parasite, they are studying how it is transmitted through the colony, when it is most virulent, and what the impacts can be at the population level. It is the first step in a much wider effort that will eventually close in on a suite of pathogens to control the ants, says Plowes. "This isn't an Ebola solution for crazy ants. What we have learned from decades of work with fire ants is that no single organism will be a silver bullet. Long-term control of invasive ant populations will depend on a cocktail of host-specific pathogens and parasites." The Texas Invasive Species Program has been established at The University of Texas at Austin with support from the Lee and Ramona Bass Foundation. The study's authors, in addition to Plowes, were Larry Gilbert, Ed LeBrun and Nathan Jones of UT Austin and James Becnel, David Oi and Steven Valles of the U.S. Department of Agriculture.